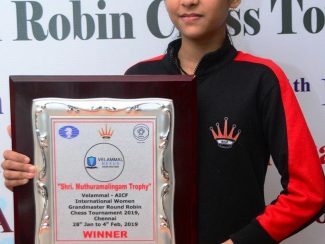 13-year-old Woman International Master Divya Deshmukh with 8.0 points emerged the Champion after the final round of the Velammal – AICF Women International Grandmaster Round Robin Chess tournament 2019 at Hotel Abu Sarovar Portico, Chennai here today. 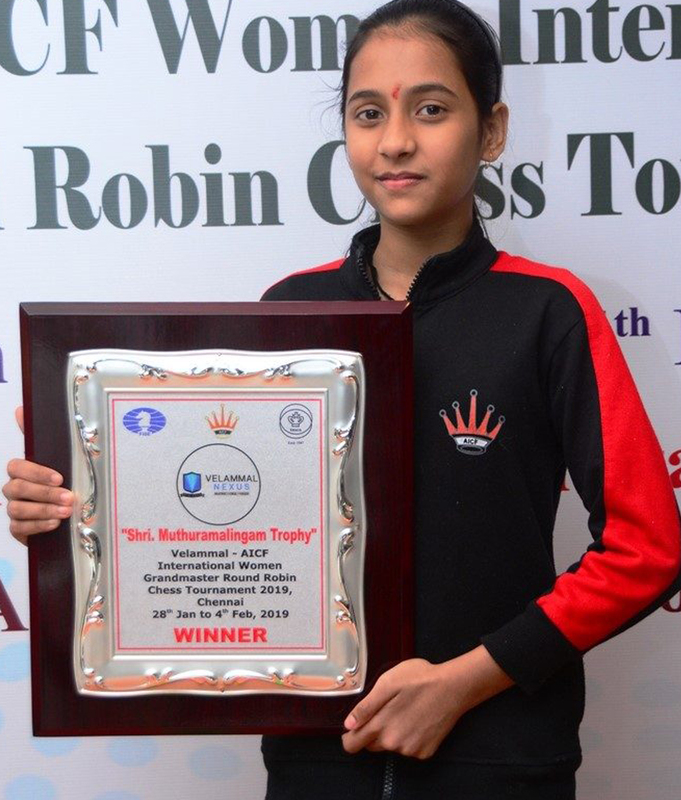 Divya takes home a handsome trophy and the winner’s cheque of Rs. 150000 (Rupees One lakhs fifty thousand only). The second place was shared by Osmak Iulija (Ukraine) and Michelle Catherina (India) at 7.5 points. 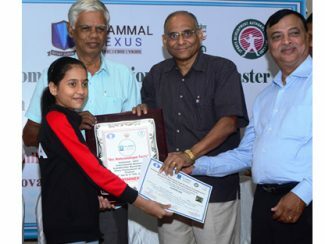 Osmak and Michelle were awarded cash prizes for Rs 1.25 lakhs and Re. 1 lakh respectively. In the final round, overnight leader Michelle Catherina went down to Osmak Iulija (Ukraine). 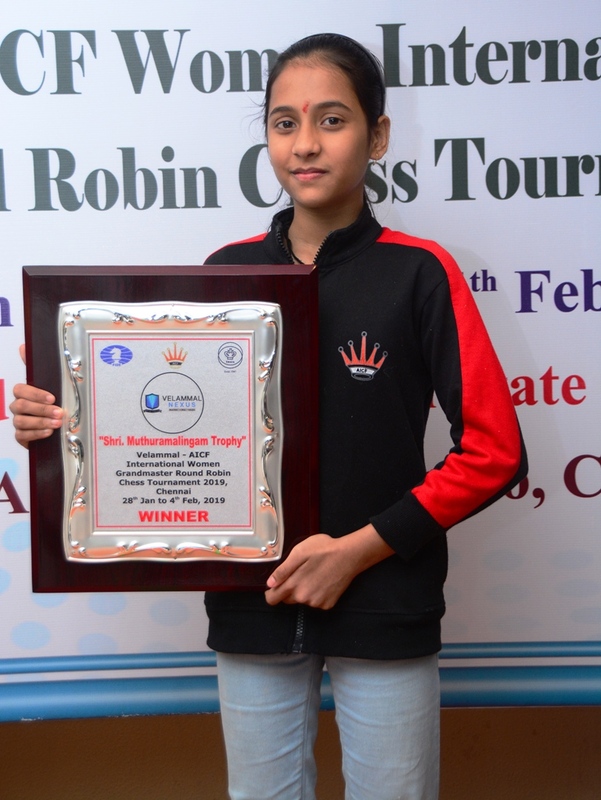 Michelle loss, saw her being overtaken by Divya Deshmukh who sailed to 8.0 points scoring over fellow Indian Chandreyee Hajra. 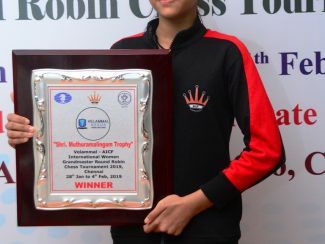 The tournament saw Divya Deshmukh achieveing an International Master Norm and a Woman Grandmaster Norm, while Michelle Catherina P made her maiden Woman Grandmaster Norm. Cash Prizes to the tune of Rs. 750000 (Rupees Seven Lakhs fifty thousand only) were distributed by Chief Guest R Anantharam, Chairman Arbiter’s Commission, AICF. 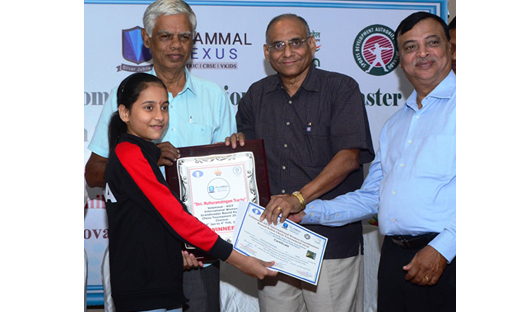 Present in the dais were International Master Manuel Aaron, Shri D V Sundar, Vice President, FIDE, Shri Stephen Balasamy P, Gen. Secretary, Tamil Nadu State Chess Association, Shri B Murugavel, Vice President, Tamil Nadu State Chess Association.